Saddle: Is 1.9 km uphill along E-134, from the road fork (near Nutheim) to Rauland. How to get there: From Oslo, drive E-18 towards Drammen, then E-134 passing the city Kongsberg to the smaller city Notodden. The distance to Notodden is 100 kilometer measured from Sandvika (about 10 km outside Oslo). Continue through Notodden along Hwy. E-134, measure distances from the traffic circle in Notodden (there is only one). Continue 57.9 kilometer along E-134. At kilometer 21.3, (in Sauland), a road turns left just opposite of a white church. This road can be followed (on foot) almost to lake Slåkåvatnet (690m), providing an alternative trailhead. The road is closed to public traffic, however, so the hike would be substantially longer. At kilometer 44.7 you cross the prominence saddle of Mælefjell at elevation 423 meter. 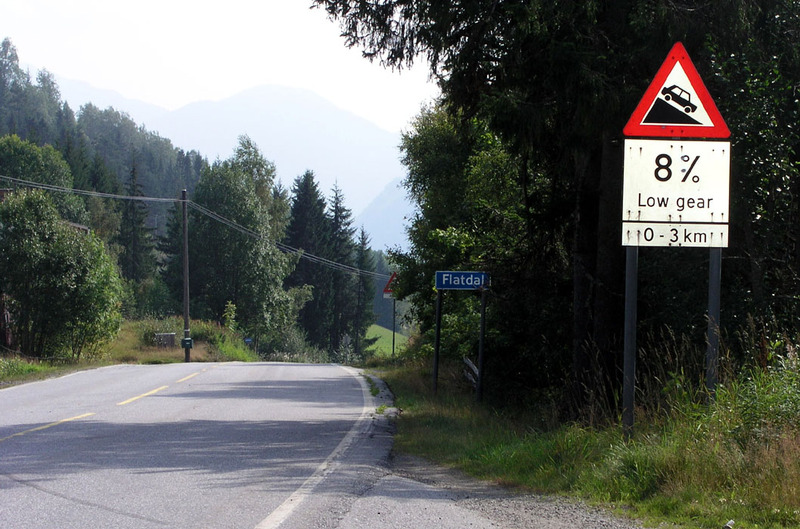 Descend down to Flatdal and drive south on the east side of the lake Flatsjå. Shortly after the lake look for a road at km 57.9, going left with a sign saying "Grimås 8". The precise location of this turnoff is N59:30.025, E008:38.256, elevation about 135 meter. Turn onto this road and pay toll (NOK 35 in 2004) at the machine located on the left side of the road 200 meter after turning. Continue uphill, bear left at km 59.7 and ignore the road that goes sharply right at km 64.5. Drive into the nice Grunningsdalen valley with the river coming down on your left hand side. At km 67.1, the road gets rougher and a sign warns about this. However, this road is quite ok for ordinary passenger cars, driving speed adjusted appropriately. I parked on the left side of the road 2.8 kilometer after the rougher road sign. This location is at km 69.9, N59:32.498, E008:46.721, elevation about 688 meter. There may be other options, see the text below. Driving time from Oslo with no traffic is about 3 hours. 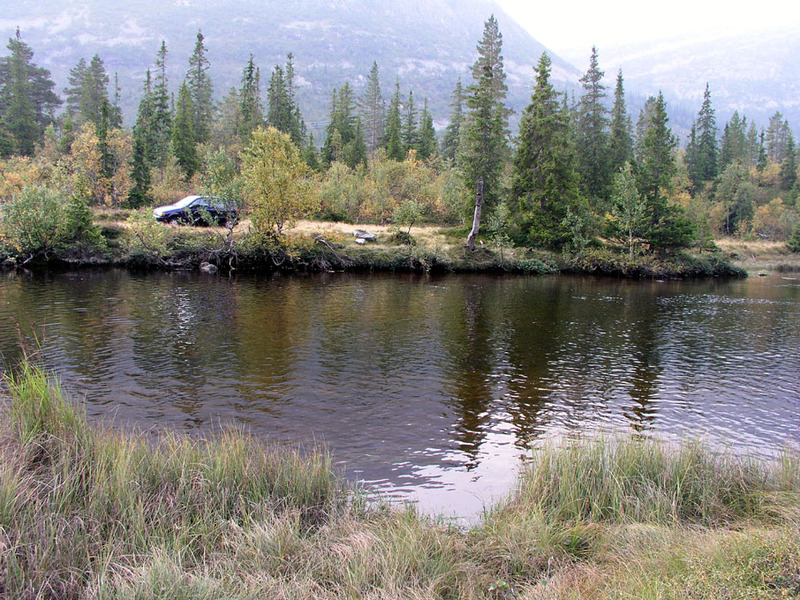 Route description: From the location (see above) where I parked, you are next to a substantial river, Grunnåi. I drove to the end of the road looking for a possible bridge or crossing, but found none (there may be one, I did not want to "waste" too much time looking for it). The river is safe to cross at the trailhead location specified above, but it is more than 10 meter wide. Depth to my hip, unless you have very long legs and make the right steps you may as well prepare to get wet up to your waist. In early September, the temperature was not too bad, cold but tolerable. 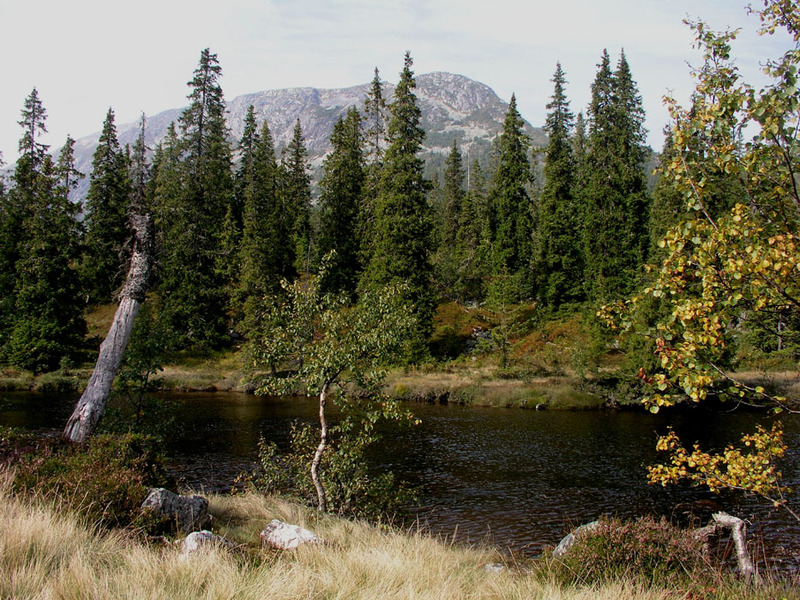 An alternative is obviously to hike around the Slåkåvatnet lake, but this adds substantially to the overall hike and a couple of river crossings may still be tricky. The week before I made this hike was very rainy, I do not know how much this affects the size of this river. Once on the north side of the river, head uphill setting your course a bit to the right (east) of the very distinct point 1136 that you see above you. The terrain is easy. As you gain the plateau with a more gentle slope ahead, bear right. The best route does not climb the higher ridge up front (left), but climbs more gently towards north-west to the outlet of lake 1280 (N59:33.361, E008:44.444). Continue passing the three small mountain lakes. Turn more west and ascend to the summit. 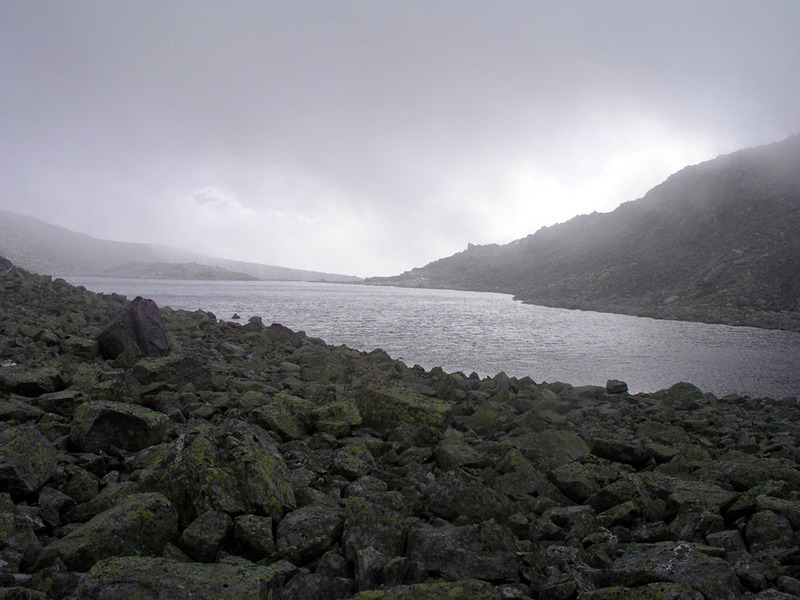 Alternatively, one may hike on the west side of the lakes or cross between the last two lakes into the very distinct saddle south of Mælefjell, then ascend directly. The difficulty of this hike is (YDS) class 2 (no trail and lots of rocks). 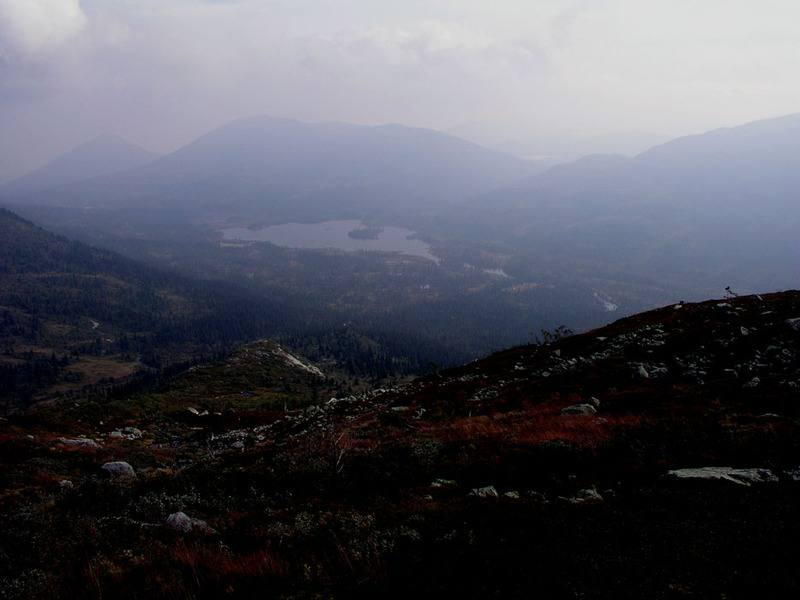 Comments: Knowing that a high primary factor almost always implies excellent views, most people would guess that Gaustatoppen has the highest primary factor in Telemark. Somewhat surprisingly, this distinction belongs to the very little known Mælefjell, 40 meter superior to its famous neigbor a bit further north. I left Sandvika outside of Oslo at 0530, wasted some time looking for a (public) toll road near Sauland, before driving around the mountain to Grunningsdalen. There, I looked for a possible crossing of the river before deciding to ford it. I was on my way into the river at 0900, arriving at the summit in dense fog and strong wind two hours later at 1100. There was a summit register at the cairn, the last entry from mid August, this mountain receives relatively few visits. I started down after about 15 minutes, with zero visibility and cold wind there was little reason to stay any longer. I crossed the river with pants and boots, dry clothes waiting in the car. Back at 1245, soaking wet. I started home at 1300 and arrived in Sandvika shortly before 1600. Overall, a very nice trip to a mountain that had been high on my list for some time. The M711 map gives an elevation of 1413 meter, while the economic map with finer contours, assign 1414.5 meter to a nearby point on the ridge, while the benchmark is still listed at 1413 meter. We therefore assign 1415 meter to the highest point on the ridge. Point 1136, as seen from the trailhead. The river Grunnåi in the foreground. 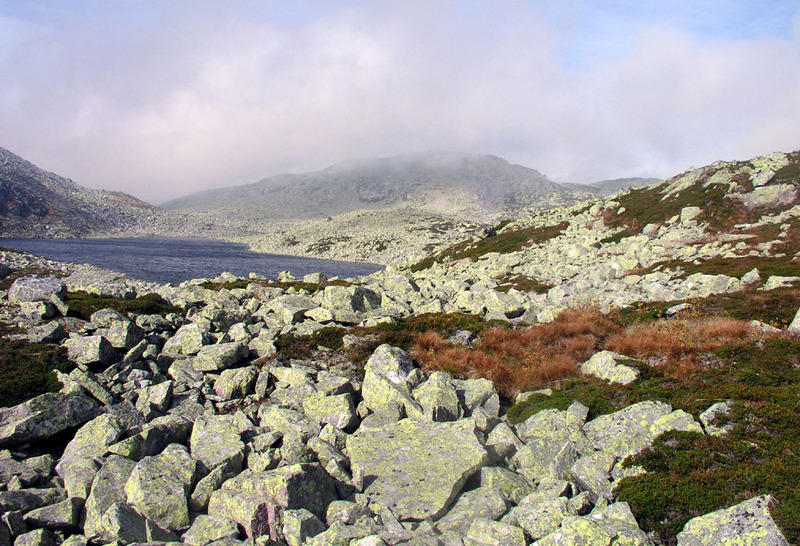 Mælefjellet landscape, elevation 1300 meter, the summit is behind the inner lake. 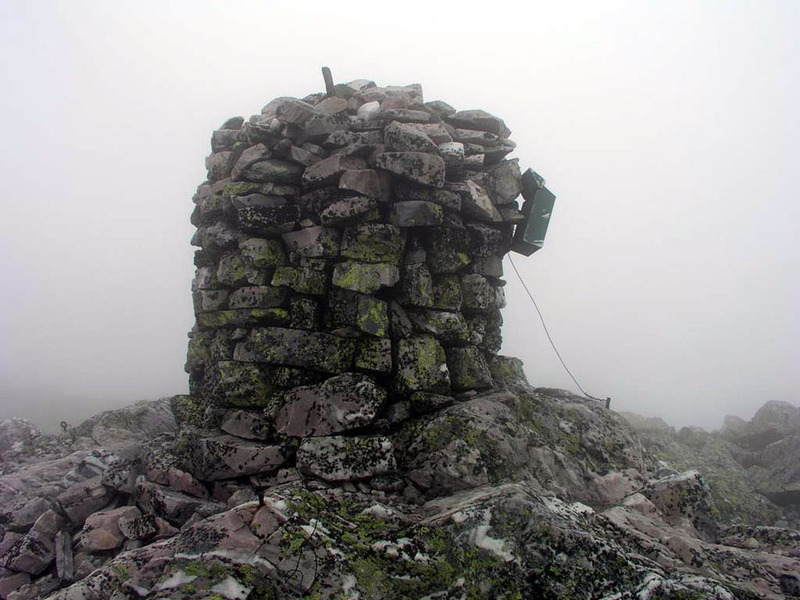 The summit cairn on Mælefjell. Lake 1291, the view is east. The terrain is slightly cumbersome, rocks and more rocks. 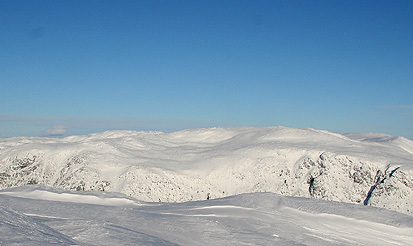 Slåkånuten, 1260m, the view is east across the valley Londalen. Lake Slåkåvatnet, with the river Grunnåi draining right. View while descending. Mælefjellet, as seen from Grunningsdalen. The key saddle, 423 meter belonging to Mælefjell.